Coder Bunnyz is a coding game created by Samaira Mehta when she was a second grader. Her goal was to combine her love of bunnies and coding into a board game so that children of all ages could also learn to code. Coder Bunnyz is designed for 1-4 players ages 4 and older, and the difficulty scales up as players master game skills. The objective of the game is to navigate your bunny to their carrot and then to your destination first. There are thirteen variants in the game, and as the player skills increase the gameplay can advance with their skills. Level 3: Strategic and Code-it! The basic gameplay has a few consistent elements across all levels. 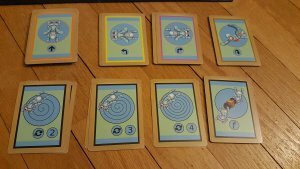 These include selecting cards and programming the movement your rabbit takes to first get their carrot and then go to their destination. At some levels, the number of cards you draw is determined by rolling the die. The pool of Code Cards increases as you advance through the levels of play, and the cards become more complicated in what they represent. Coder Bunnyz is a great accessible game to introduce young children to the basics of coding and to develop coding skills in older children. I introduced it to my 6-year-old and he picked right up on the concept of planning the movement of his bunny. As a beginning player, he did benefit from some coaching, as well as the Bug-Fixit! Token to undo a move that would not have worked. We played through level 1.1 and 1.2 which is the most simplistic and introduces the sequence cards and the jump card. Having thirteen variants of play included within the four basic levels allows the game to scale with the age and skill level of the players. This makes it challenging and engaging for players of all levels. One thing we noticed while playing Coder Bunnyz was game board was bumped frequently causing the tiles to shift. This happened more while playing with younger players, though we were able to fix the board easily. Players who struggle with fine or gross motor skills may find the tiles shifting frustrating if the game board is bumped. Coder Bunnyz also has a strong educational benefit. It introduces the basics of coding in a friendly and accessible format. Younger beginning players benefit from coaching and direct instruction on the best way to program the motion of their bunny. Older and more experienced players can create greater challenges with the board layout to refine their strategic thinking and problem-solving skills. 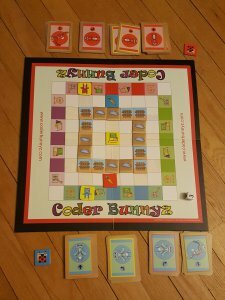 Coder Bunnyz - The Most Comprehensive STEM Coding Board Game Ever! Learn All The Concepts You Ever Need in Computer Programming in a Fun Adventure. Featured at TIME, NBC, Sony, Google, Maker Faires! For any family or teacher looking to introduce the fundamentals of coding, Coder Bunnyz provides a wonderful tool. With the focus in education on problem-solving and STEM it is critical to support children in developing reasoning and planning skills. Coder Bunnyz is a tool that can help children develop skills that will be an asset to them in school and beyond. FCC Disclosure: A copy of Coder Bunnyz was provided for review. Overwatch Is Expanding Out of The Digital World!